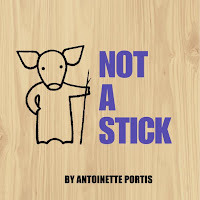 Like Not a Box, the first picture book by Antoinette Portis, Not a Stick celebrates the creativity of kids. Or in this case, a pig. This little piggy found a stick, and with it he's just as busy as his rabbit friend was with that box. Matter of fact the rabbit makes a guest appearance as a drummer! The dedication page shoes a tree with one lonely stick broken off and the pig glancing up at it. I wouldn't have thought it possible with drawings this simple, but that pig has a creative sparkle in his piggy little eye as he's checking out that stick. This time the grown-up (the assumed grown-up, anyway) skips questions and jumps right to warnings. "Hey be careful with that stick." It is rather pointy, I guess, and one might mistake the creative sparkle in the pig's eye for mischief. Maybe. Nevertheless, the warnings come. Look where you're going, watch out where you're pointing, don't trip. All about the stick! But, of course, it's not a stick. It can catch sharks! It can create a van Gogh! Dragons? No problem! Can a stick do that? No stick can do all that, but this is not a stick. Matter of fact, that's exactly what the pig says. "It's my Not-a-Stick."